For most of us, day starts and ends with Computer – Social networks, searches and more ....... so used to search for all that we have in mind on the web (one would end up typing ‘what do I have in my mind’) ~ and the most preferred search engine is ‘google’. Google puts special doodles marking special occasions and days. ‘Google doodles’ on homepage of the search engine has made it more fun and enjoyable for the users and nobody ever anticipated that it would become so popular. Nowadays, many users excitedly anticipate the release of each new doodle and some even collect them! 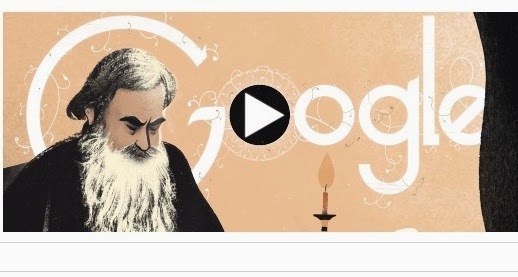 Today, there is special google doodle – not a plain picture or animated one – it is more elaborate – a slide show ... it begins with an image of a bearded man busy writing at his desk by candlelight before presenting scenes from his most famous works............. one of which is widely regarded as one of the most important works of literature. It tells of the events surrounding France’s 1812 invasion of Russia and documents life in the Tsarist society of the Napoleonic years through the eyes of five Russian upper class families. The man’s lasting influence is a testament to the power of his art, which will remain relevant as long as the questions of life and death occupy our minds, which is to say – forever. It is Leo Tolstoy. Count Lev Nikolayevich Tolstoy (1828-1910) was a Russian writer, philosopher and political thinker who primarily wrote novels and short stories. Tolstoy was a master of realistic fiction and is widely considered one of the greatest novelists of all time. 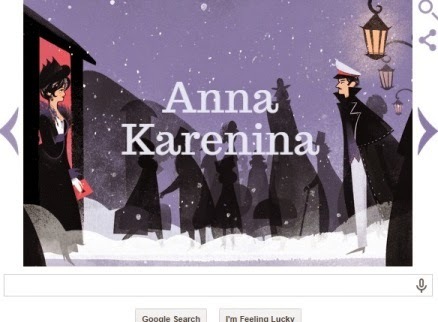 He is best known for two long novels, War and Peace (1869) and Anna Karenina (1877). Tolstoy is equally known for his complicated and paradoxical persona and for his extreme moralistic and ascetic views, and known as a moral thinker and social reformer. In 1862, Tolstoy married Sophia Andreevna Behrs, 16 years his junior and the daughter of a court physician. They had thirteen children. War and Peace is generally thought to be one of the greatest novels ever written, remarkable for its dramatic breadth and unity. Its vast canvas includes 580 characters, many historical with others fictional. The story moves from family life to the headquarters of Napoleon, from the court of Alexander I of Russia to the battlefields of Austerlitz and Borodino. Anna Karenina was reportedly published in serial installments from 1873 to 1877 in the periodical The Russian Messenger. Tolstoy clashed with editor Mikhail Katkov over political issues that arose in the final installment (Tolstoy's unpopular views of volunteers going to Serbia); therefore, the novel's first complete appearance was in book form in 1878. Anna Karenina is the tragic story of a married aristocrat and her affair with the affluent Count Vronsky. In 2012 came the British epic romantic drama film directed by Joe Wright of the same name, adapted from Tolstoy’s novel. Keira Knightley stars in the lead role as Karenina; while Jude Law and Aaron Taylor-Johnson appear as Karenin and Vronsky, respectively. It earned four nominations at the 85th Academy Awards and six nominations at the 66th British Academy Film Awards, winning Jacqueline Durran both prizes for Best Costume Design.